This post marks Part 20, the final entry of the 20-part series The Oscar 100. Thank you for joining me in this celebration of the 100 greatest Oscar-nominated performances. 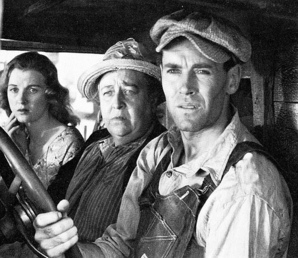 Fonda portrays Tom Joad, a parolee who ventures home, only to find his family's farm has been seized by the bank. Determined to find a better life, the Joads load up their truck and head west to California. On the road, they come across countless other families chasing the elusive dream of prosperity but, upon arriving in the Golden State, find the promised land doesn't exactly hold the riches they anticipated. The Joads' quest for success is made all the more challenging when Tom gets into trouble at one of the migrant camps they briefly settle in. This performance marked Fonda's first Oscar nomination. You know what I sometimes forget and am always flabbergasted to rediscover? Fonda, despite one of the all-time great careers on the silver screen, was merely a two-time Oscar nominee for his acting (in addition to a nomination for producing 12 Angry Men and earning an honorary prize at the 1980 ceremony). He would of course go on to triumph on that second nomination, in Best Actor for On Golden Pond, but victory surely should have arrived four decades earlier, on his first Oscar appearance, for The Grapes of Wrath. Fonda as Tom Joad, like so many performances on this list, is hardly the most extravagant of portrayals, with one tantalizing "Oscar scene" after another. That is hardly to say, however, it's not a completely pitch-perfect, lived-in and sublime turn, which also has the great fortune of gracing one of the finest of all American pictures - so significant, it was among the first batch of films selected for preservation by the the Library of Congress. Brooding, yet headstrong, Fonda is a powerful presence throughout the picture, at once impossible to take your eyes off of, yet also allowing for his co-stars, namely the brilliant (and deservedly Oscar-winning) Jane Darwell, to shimmer alongside him. The picture sports one of the most splendid film ensembles from this era, with each masterful actor having a chance to shine. Even so, leading man Fonda is of course MVP. If Tom is exasperated over his family's exhausting ordeal, he buries such vexation and charges forward, desperate to at last land the Joads in a stable environment, with reliable work and pay. There is one daunting obstacle after another in these camps and, while the most strenuous of struggles, these experiences also instill in Tom a worldliness that will forever change his mission in life. Fonda has countless affecting moments in The Grapes of Wrath, the best tending to come opposite Darwell, like their heavenly final dance together and her unsuccessful pleading for him to stay with the family. He most soars, however, in his big monologue toward the picture's conclusion, as Tom tells his fellow Joads he will be leaving to join the social justice movement and support the limitless families, just like the Joads, who have been floundering in these impossible times. It is truly among the most inspiring scenes ever captured on film. As noted in my write-up of Chaplin, of the 1940 Best Actor nominees, critics were most fond of him and Fonda, with the former all but taking himself out of competition by protesting the ceremony. The winner, however, would be Stewart, no doubt helped by headlining not one, not two but four motion pictures that year. This was one heck of a line-up, with Stewart a delight, Chaplin phenomenal and Olivier in expert form too (Massey, while amusing, seems to think he's still playing to the last row of the balcony). None of those fine actors, however, can quite touch Fonda, one of the silver screen's most marvelous leading men, at the very, very top of his game. The performance and the picture are timeless. Moore portrays Annie Johnson, an African-American single mother who befriends Lora Meredith (Lana Turner), a white single mom and aspiring Broadway actress. Both of their daughters, Annie's Sarah Jane (Susan Kohner) and Lora's Susie (Sandra Dee), are a handful. While Susie pines for Lora's dashing boyfriend Steve (John Gavin), Sarah Jane loathes being black and, given her light skin, is determined to pass for white. Her behavior leaves Annie consumed with shame and sorrow. This performance marked Moore's first and only Oscar nomination. Over the 20 years prior to her gut-wrenching breakthrough in Douglas Sirk's Imitation of Life, Moore largely languished in film obscurity, on four occasions portraying a maid, three times a 'nightclub patron' and more than a dozen times roles so minuscule, she went uncredited. For Sirk's final Hollywood production, he took a chance on Moore, who to date hadn't been blessed with a role much flexing her acting muscles, for the pivotal role of Annie Johnson. The result? The greatest performance ever nominated in Best Supporting Actress. The sad thing is, at the time, Moore didn't have much of a prayer for victory. Sure, there was some vote-splitting potential with co-star Kohner but more damaging, Imitation of Life wasn't terribly well-received by critics upon its theatrical release, with many writing it off as a saccharine soap opera. What probably got Moore and Kohner over the finish line for their nominations, in addition to Best Supporting Actress otherwise being a rather ho-hum affair in 1959, was the immense commercial success of the picture, which managed to outpace the likes of Anatomy of a Murder and North by Northwest at the box office. The Winters victory was scant surprise. Still looked upon as a blonde bombshell, she was lauded by critics and stunned audiences with her deglamming in Best Picture nominee The Diary of Anne Frank. Baddeley graced a Best Picture contender as well but was never going to win for a three-minute performance, nor was Ritter about to triumph for a fluffy romcom like Pillow Talk. Ritter, at this point on her fifth nomination, may have been plenty due for victory but Pillow Talk was not the vehicle seen as delivering that elusive win. Like other Sirk productions, Imitation of Life would not be deemed the masterpiece it's seen as today until much later in the 20th century, as contemporary critics reevaluated the picture and lavished praise upon its sumptuous look and feel and devastating performances. While marketed upon its release as a Turner film, nearly everyone today agrees Kohner and especially Moore completely steal the picture from under her, the Turner-Dee dynamic not a tenth as riveting as Moore and Kohner. On the page, Annie Johnson is written in a tenuous, mawkish way that, you would think, could translate to disaster on the screen - let's face it, the strongest parts of Sirk productions are never the screenplays. Yet, under his expert direction and with the overwhelming compassion and heartache Moore instills in the role, Annie emerges one of the most tragic sights ever seen on film. Moore shatters your heart in the most nuanced of fashions. It also sure doesn't hurt that she graces the screen for nearly half the picture and at times feels like a co-lead. Moore's Annie makes it her mission in life to please those around her. Such is an easy task with Turner's Lora, who comes to see Annie as an essential presence in her life. Less simple is satisfying Sarah Jane, an insufferable daughter who makes Ann Blyth in Mildred Pierce look like a walk in the park. Annie has the biggest of hearts, so it's downright traumatic watching her gradually whittle away, persistently sacrificing everything for her daughter and getting no love back in return. Her unconditional endearment for Sarah Jane evolves into a sea of emotions, from rage over her daughter's choices to concern she may forever lose her This culminates in their painful final scene together, in which Annie reiterates she will do nothing that gets in the way of Sarah Jane's happiness - she'll even pretend she's not her mother, if need be. Thank heavens for this performance. It's the quintessential example of an actor and director taking the wispiest of roles and turning it into gold. That Moore had spent her entire career to this point relegated to bit roles makes her accomplishment all the more astounding. Clift portrays George Eastman, the outcast nephew of wealthy industrialist Charles (Herbert Heyes) who abandons his destitute existence in Chicago to work for his uncle in California. There, he climbs up the company's ranks and becomes romantically involved with co-worker Alice Tripp (Shelley Winters). At a lavish party thrown by his uncle, George falls heads over heels for the enchanting socialite Angela Vickers (Elizabeth Taylor), who introduces him to the area's high society. George is enraptured by his opulent new lifestyle and companion - a development thrown for a loop by Alice's revelation that she is pregnant with George's child. This performance marked Clift's second Oscar nomination. Today, A Place in the Sun, director George Stevens' masterpiece and the career-best vehicle for stars Clift and Winters, is mostly, tragically a forgotten picture. Generally overshadowed by another big Oscar winner from 1951 (A Streetcar Named Desire), the film was dropped by the American Film Institute in its 2007 update of its list of the 100 greatest American motion pictures of all-time. No surprise, it is absent from IMDb's list of the 250 top-rated films. More stunningly, it inexplicably sports a mere 75 percent rating on Rotten Tomatoes. Upon its theatrical release, A Place in the Sun was in fact a mammoth critical and commercial success. Charlie Chaplin spoke for countless movie buffs when he proclaimed the film "the greatest movie ever made about America." While it lost the Best Picture Oscar to the decidedly splashier An American in Paris, it tied the Vincente Minnelli film in wins (six) and outpaced Streetcar's showing (four victories) on the big night. Catapulted into movie super stardom was Clift, who five years earlier moved out to Hollywood and secured one splendid project after another - the likes of Red River, The Search and The Heiress. He had dashing matinee idol looks with awe-inspiring acting chops to set him apart from the ordinary silver screen pretty boy. While Clift proved himself an exemplary screen presence in The Search, which earned him his first Best Actor nomination, it was A Place in the Sun that provided him the grandest opportunity to flex those muscles as an actor. The result would be the greatest male performance ever recognized by the Academy. Clift sends you into a heavenly trance from the moment he graces the screen, his physical appearance striking as can be but with immense depth clearly present under the handsome surface. With Stevens' camera madly in love with the star, Clift's face shimmers and sparkles, oozing so much beauty that it's all too easy to overlook George's faults. And when Clift shares the spotlight with Taylor, who also has never looked more fetching, it's almost too much perfection to handle. For such an alluring man, Clift also exudes so much vulnerability as George, a lost soul who's ditched his poor life back home for a chance at prosperity many, many miles away. His lack of confidence makes the predicament he finds himself in all the more distressing. And though George may sometimes act in the most detestable of ways, Clift fills the character with ample warmth and heart. His sweetness stays with you, even as George skids off the tracks into oblivion. As Clift did with countless directors over his career, he had the occasional quarrel with Stevens, who sometimes craved from the actor showier displays of emotion. To Clift, however, that was all wrong - his portrayal of George needed to be restrained and natural. Instead, for instance, of chewing scenery at the 11-'o-clock-hour as George walks to his death in the electric chair, Clift looks all too convincing, solemn and vividly anguished with regret. Oscar night attendees, including ultimate winner Bogart, were said to have been convinced Brando had it in the bag. Even Clift said he cast his vote for the Streetcar star. Alas, the champion would be the sentimental favorite. Perhaps Brando and Clift, the method actor newcomers, split the vote in some way. No doubt, Brando also wasn't helped by his refusal to campaign the picture for awards consideration and wariness of actors competing with one another for prizes. Three years later, Brando would campaign and emerge victorious for On the Waterfront. This was one hell of a category, with March in prime form too. But no one, in my humble opinion at least, comes close to Clift, not even Brando. He's the most mesmerizing of sights from start to finish, exuding boundless charisma while carefully crafting an absorbing character who, in lesser hands, could have been a far less compelling figure. Clift would go on to deliver several more great performances but none quite at the same unconquerable level as A Place in the Sun. Johnson portrays Laura Jesson, a restless suburban housewife whose marriage to Fred (Cyril Raymond), while amiable, has left her emotionally unfulfilled. Amidst her routine of spending one day a week in a nearby town to shop and take in a movie, she meets Alec Harvey (Trevor Howard), a kind and handsome doctor who, like Laura, is married and has children. Enchanted with each other's company, their casual friendship gradually develops into something much more as Laura and Alec realize they've fallen in love. The closer they get, the more agonizing their union becomes, knowing they'll surely never actually leave their respective spouses. This performance marked Johnson's first and only Oscar nomination. Over the two decades prior to her awe-inspiring silver screen turn in David Lean's Brief Encounter, Johnson was the toast of the London theatre scene, appearing in a plethora of productions, including headlining the likes of Pride and Prejudice and Rebecca. She even briefly appeared on Broadway, taking on the role of Ophelia in a revival of Hamlet. Then came World War II. During this time, Johnson lived with her widowed sister and sister-in-law, assisting them in the care of their combined seven children. Now unable to devote time to eight shows a week, Johnson turned to radio and film. Taking a liking to the stage star was Lean who, at this early stage in his career, was known exclusively as a film editor. Lean cast Johnson in his directorial debut, In Which We Serve, which earned an Oscar nomination in Best Picture. Lean and Johnson would collaborate twice more during their lives, first on This Happy Breed and finally, most memorably, on Brief Encounter. A far cry from the comedies Coward was so renowned for, Brief Encounter is the most devastating of affairs, sensitively directed by Lean (much in the same careful fashion he later approached Summertime) and exquisitely performed by Howard and especially the picture's leading lady. Even in moments devoid of dialogue, Johnson is able to say so much through those big, captivating eyes, keeping us attune to the roller coaster ride of emotions Laura is going through - it's like watching lightning strike the moment we see her realization that she's fallen for Alec. This is one of those rare, magical performances that could have succeeded just as splendidly in a silent film as a talking picture. Johnson paints Laura as a woman who, in a different environment, could be wholeheartedly thriving. Alas, she clearly loathes the spiteful women who socially surround her and isn't terribly keen on middle-class suburbia in general. Laura hardly hates Fred - he's a good-natured, honest man - but recognizes, tragically too late in their marriage, that there's no real romance there. Laura has no doubt spent ages in this painful state of longing and only with the entrance of Alec, with whom she does share an intense sensual feeling, do those repressed emotions at last erupt to the surface. Like Hepburn in Summertime, the restrained nature of Johnson's performance makes it all the more powerful and heartbreaking. With that said, what were Johnson's odds on Oscar night? Not bad, considering the category was without a real front-runner. With the exceptions of Jones, whose picture was lambasted by the critics (her recent divorce, the result of an affair with producer David O. Selznick, probably didn't help matters either), and Wyman, whose recognition rang of a coattail nomination, a plausible case could have been made for any of de Havilland, Johnson or Russell. Ultimately, the winner would be de Havilland who, by age 30, was already seen as an old pro in the business, at this point on her third nomination. De Havilland's in fine form, so you won't see me bashing her victory, other than to say Johnson is of course much better. Rowlands portrays Mabel Longhetti, a lonesome Los Angeles housewife who is desperate to please husband Nick (Peter Falk) and their three children. Nick loves Mabel but is concerned about her increasingly outlandish and unpredictable behavior. Convinced she poses a threat to both herself and the family, Nick reluctantly institutionalizes her. After a six-month treatment, Mabel returns home but is hardly prepared, emotionally or mentally, for a seamless reintegration. This performance marked Rowlands' first Oscar nomination. Well, at last, here it is - for my money, the most extraordinary turn to ever earn an Oscar nomination. To know it was a miracle A Woman Under the Influence came to fruition at all makes Rowlands' tour de force one to even more treasure. The picture, after all, was initially designed by John Cassavetes as a play. The material, as challenging and intense as what would ultimately be seen on film, was deemed by Rowlands as just too much to pull off, without herself suffering a nervous breakdown, eight shows a week. So, Cassavetes tailored his tale of Mabel Longhetti to the screen. Despite the critical success he and wife Rowlands earned on their prior collaborations - A Child Is Waiting, Faces and Minnie and Moskowitz - no studio was willing to bite on A Woman Under the Influence and its exploration of an unstable, middle-aged housewife. In part rescuing the project was none other than Falk, who loved Cassavetes' screenplay so much that he invested half a million into the production - and would, of course, go on to land the crucial role of Nick. Without a distributor, it was up to Cassavetes to call theatre owners and art houses to get A Woman Under the Influence before an audience. Word about Rowlands' master class in acting spread rapidly and, by the end of Oscar season, even as she failed to win the Best Actress prize, the film made back more than six times its budget. While Cassavetes worked wonders in generating box office success for the film, the lack of an awards season campaign by a major studio perhaps played some role in Rowlands' Oscar loss (as, no doubt, did the traumatic nature of the film). Burstyn and her picture had Warner Bros. behind them, Dunaway had Paramount, Carroll was in a 20th Century Fox film and Perrine (who insisted on a Lead campaign when she surely could've won in Supporting) had United Artists. Instead of standing tall as category front-runner, which should've been the case, Rowlands was seen as being in a tight three-way race with Burstyn and Dunaway. Likely putting Burstyn over the top, in addition to being on her third Oscar nomination, were the raves she simultaneously received for her Broadway turn in Same Time, Next Year, the production which prevented her from attending the ceremony. It's conceivable New York voters came in strong for Burstyn, who would go on to also score the Tony that year. This may have been a fabulous line-up (Carroll is terrific too) but Rowlands is truly in a league of her own. If Burstyn wasn't in such fine form, I wouldn't hesitate in the slightest to classify this as among the all-time worst Oscar decisions. To merely label A Woman Under the Influence as depressing would be an understatement. It's perhaps the most taxing and devastating of cinematic experiences, a portrait of a woman and her family in pandemonium that rings both bizarre and all too true. Never before or after has mental illness been portrayed so vividly on the screen, its horror and ugliness on evocative display. Rowlands, in a role that to the average actor, on paper, would seem all but impossible to effectively portray, is absolutely fearless as Mabel. Never is there a false note as Rowlands chaotically veers from terror to rage to revulsion to wholehearted love and devotion. At once, she can be both horrifying and irresistible. She's an erratic force of nature, with one surprise after another up her sleeve. For every moment she's thunderous and unhinged, there's another in which she is subdued to the point of speechlessness. A performance for the ages that continues to stun nearly 50 years since first gracing the screen, Rowlands in A Woman Under the Influence is the crème de la crème, perhaps the most magnificent piece of acting ever captured on film and, at the very least, the finest turn recognized at the Oscars.